2009 FRC Lunacy- "Egg Beater"
Lunacy is the game for the 2009 FRC. Announced on January 3, 2009, the name and some of the features of the game honor the 40th anniversary of the first manned misson to the Moob (Latin: Luna). It is FRC's 18th game. 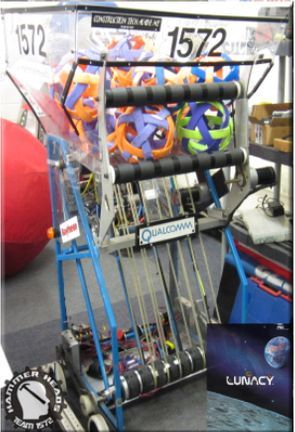 This is the first FRC competition to use the cRIO Mobile Device Controller control system from National Instruments. The driver station introduced for 2009 was the Kwikbyte DS, which was replaced in 2010 by the Classmate Pc.